"This is called...The Song Remains The Same." 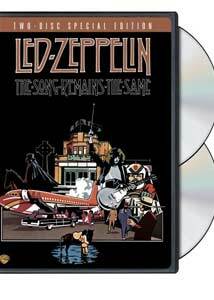 Back in my high school days during the late 1970s, a staple of the midnight movie circuit was the 1976 stoner Mecca known as Led Zeppelin's The Song Remains The Same, a film that could have been flawless had it just been footage of the band's legendary 1973 Madison Square Garden concerts. But it wasn't. And even though no one really wanted to sit through the absurd fantasy sequences or self-indulgent home video footage that separated the music (and seeing that this was in the era well before the explosion of VHS), it was one of the only outlets for roaming bands of teens-under-the-influence to find collective solace for a couple of hours while our buzzes wore off before we went home. To make matters worse, I was one of the musical black sheep of my friends, the guy who could never grasp the Zep appeal (no matter how hard I tried), and instead eventually fell in hard with the likes of The Damned, The Ramones, and The Clash. But there was no escaping the massive entity that was Zeppelin. With this 2-disc special edition of The Song Remains The Same, it's forward-into-the-past time, only now it's been enhanced with an anamorphic transfer and audio choices that include wall-rattling Dolby Digital 5.1 and DTS mixes. But we're still stuck with all the Spinal Tap-ish stuff that falls before and after the concert performances, so enduring a painfully overdone gangster sequence or Robert Plant as some kind of rejected Middle Earth warrior still reeks with the kind of grand pomposity that only the most celebrated rock band in the world (at the time) could have mustered. No matter how many times I was dragged to a midnight showing of this, I was always struck dumb that an insanely popular band with so many fans would want to make them sit through this 138-minute exercise in ham-fisted 1970s rock star excess. And even though I didn't really come to appreciate Zeppelin (some, not all) until decades later, I could always recognize some kind of brilliance during the 1973 concert performances gathered in The Song Remains The Same. Forget the ridiculous in-between material that litters the rest of the film, because it's the band playing live that this overdone ego trip is all about. Plant struts and preens with those too-tight blue jeans, unleashing that distinctive voice like a high-pitched cannon blast, while Jimmy Page plays starchild with a double-neck guitar, pausing only to elevate his coolness by launching into a solo with violin bow during Dazed and Confused. Even John Bonham's drum solo (hello 1970s! ), for all of its barehanded momentum-killing meandering, has a certain ballsy rock cool that is hard to ignore. It's a portrait of a band locked tightly near their zenith, with all four members in their prime and meshing like a big rock dinosaur out to trample anyone in its path. Few of the bands I ever truly loved have had a fraction of Zeppelin's longterm notoriety and fame, so I'm not here to piddle on their successes. It's just that an exercise like The Song Remains The Same is a miscue of the highest order, botching up the simple task of capturing a live concert. The technical improvements found on this new special edition�specifically the audio�do well to dress up the best parts (the band playing live), and at least today, we can fast-forward through the over indulgence. Image Transfer Review: The film is presented in 1.85:1 anamorphic widescreen. An improvement over the earlier DVD release, the problem is that this one is going to only ever look so good. There's a continual grain problem, and edge details are quite soft, most notably during the non-concert bits. On stage, things fare slightly better, though the image quality is never especially sharp, and elements like stage lighting cause occasional bloom. Black levels are tolerable, but certainly lack the kind of definition and depth that could have enhanced the video quality. Audio Transfer Review: The new audio mixes are really where this new SE earns its stripes, with a trio of remastered options culled from the original master tracks, available in either PCM, Dolby Digital 5.1, or DTS. The audio presentation is the selling point (especially the standout DTS mix) and though the filler bits (aka "non concert footage") are still a little tinny, the music performances are big, loud, and exceptionally detailed. Bonham's drumming and Jones' bass carry a deep, booming footprint throughout, with Plant's vocals clear and distinct, matched by the revealing clarity of Page's guitar work. This one goes to 11. Excellent. Extras Review: Disc 1 carries the feature, which is cut into 24 chapters. There is also a menu option to individually jump to any of the concert segments if you wish to bypass the often dreadful filler. Over on Disc 2, the highpoint is a set of four additional concert performances, for the songs Over The Hills And Far Away (06m:20s), Celebration Day (Cutting Copy) (03m:41s), Misty Mountain Hop (04m:52s), and The Ocean (04m:42s). All are presented in anamorphic widescreen, and include the same Dolby Digital 5.1/PCM/DTS audio options as found on the main film. These four clips are the best part of the bonus material, and just having them would have been more than enough. For a good a laugh there's the Tampa News Report (03m:26s), a wow-local-television-news-looked-bad-in-1973 puff piece on the band's 1973 sellout of Tampa Stadium. The anchor (sporting some dandy Where's Waldo? eyeglasses) refers to Zeppelin as being "popular with the acid rock crowd" before handing it off to a street reporter who documents the band's arrival as if they were heads of state. Boating Down The Thames (08m:21s) pairs up manager Peter Grant and Robert Plant on a windy boat, fielding questions from an interviewer. The setting is odd, but Plant gets to chime on how they wanted to expand their self-indulgence with the film, something they certainly succeeded in. The Robbery (05m:04s) is press conference footage documenting the 1973 theft of $200,000 of concert cash during the tail end of Zeppelin's run at Madison Square Garden, led by the always intriguing Peter Grant. The extras conclude with the audio only Radio Profile Spotlight By Cameron Crowe (1976) (15m:00s), which is a soft volley of platitudes and accolades. In retrospect, the Spinal Tap-ishness of The Song Remains The Same�with its pretentious sidebar excess�is almost comical. And it's a damn shame, too. Simply having the concert footage would be more than enough for any Zeppelin fan, but instead we all have to sit through gangster vignettes, John Bonham driving farm implements, and silly mystical fantasy sequences while we wait for the next chance to rock. This new 2-disc SE carries remastered Dolby Digital 5.1 and DTS mixes, and sounds best turned up loud.